Add some spice to your life. 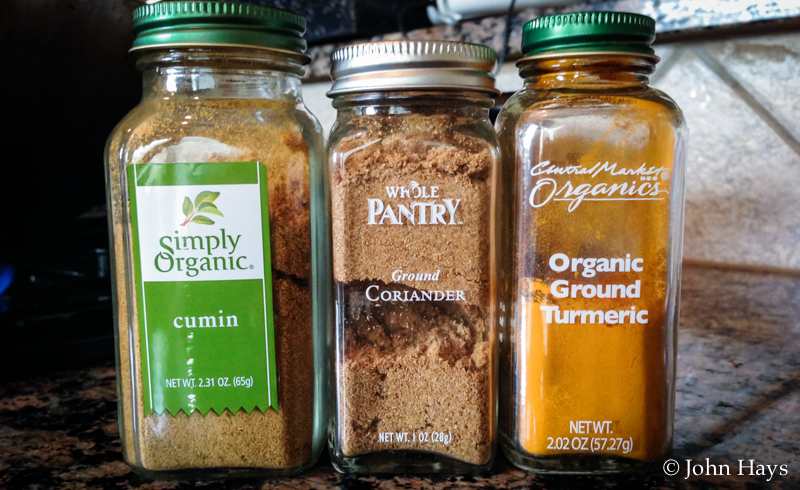 These three spices are super tasty and super healthy, and go well together! Cumin is an ancient herb that dates back all the way to the second millennium BC. It’s even mentioned in the Bible. The ancient Greeks kept cumin at the table like pepper; the Moroccans still do. It’s used commonly in Brazil, and is added to provide an earthy warmy feeling to food and is often used in chili. It is used for enhancing appetite, taste perception, digestion, vision, strength and helps with issues such as fever, loss of appetite, diarrhea, vomiting, abdominal distension, edema and puerperal disorders. The leaves of the coriander plant are known as cilantro and are used as a garnish and flavoring in many dishes. The seeds are where the coriander spice comes from, and they provide significant amounts of calcium, iron, magnesium, and manganese and contains strong antioxidants. It’s used in flavoring meats and brewing Belgian beers. Turmeric is part of the ginger family. It’s commonly used to color mustard and used in curries. While there are some Indian sweet dishes that use turmeric, it is generally used for its savory properties. It’s used in canned beverages and baked products, dairy products, ice cream, yogurt, yellow cakes, orange juice, biscuits, popcorn color, sweets, cake icings, cereals, sauces, gelatins, etc. In India turmeric has been used to treat stomach and liver ailments as well as skin conditions. Turmeric is being investigated in relation to Alzheimer’s disease, arthritis, diabetes, and other clinical disorders. So as you can see, not only do these spices add flavor to your dishes, they add health to your life! Try them on your next meal and let me know how you like them!